Wild Play SuperBet - Trigger the Bonus feature and win Big! Are you bored stiff with the slow-paced games? Do you want to take your play to the next level? In that case, Wild Play SuperBet video slot will do the trick. First of all, this game has a SuperBet feature that you’re probably familiar with if you’ve played Merlin’s Millions before. So, it’s suitable for players of all budgets even high rollers! When it comes to Wild Play SuperBet, it’s worth knowing that it’s an exclusive game to Golden Nugget Casino. So, if you’re already an account patron there you can start playing this game right away. If not, you can easily sign up and claim the bonus they have waiting for you. But before you dash off, check out the below game review. It has essential information that you should know before playing this new game. How to trigger the bonus features of Wild Play SuperBet video slot? The main feature of this game is the multiplier. Indeed, its triggered when you win with one or more wild symbols. When active, your winnings will drastically be multiplied up to 15x! It’s worth knowing that the wild can replace any symbol, except the scatter symbols. Moreover, the wilds can only appear on reels 2, 3 and 4. The next cool feature is the free spins bonus. It’s activated with 3 scatter symbols and you’ll automatically win 80 coins plus 10 free games. It’s as simple as that! The free games are also re-triggerable in the bonus. Consequently, you could win a total of 20 free games when you’re lucky. Last but not least, the SuperBet feature lets you define the value of the wild multipliers. Essentially, wild multipliers range from 1x to 5x. To top it all off, they will increase during the free game round. 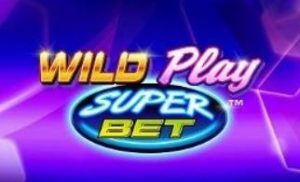 Why should you play Wild Play SuperBet video slot? Relatively speaking, the volatility of this video slot is on the high side. Very much like the max win of this game. So risk-takers come out now and have fun. This is your time to shine and chances are you’ll love this game. Also, it’s worth knowing that you can secure a whopping 30x multiplier during the free spins. Well, that is if you’re brave enough and if your bankroll allows you to activate the SuperBet feature. We think that the fusion of conventional and contemporary graphics, sounds and concepts bring an old-style video slot back to life to such an extent that you will find this game extremely engaging. This game is compatible with any devices. So, you can enjoy it in the comfort of your own home as well as when you are on the go. So, why not trying it today on a online casino?